Cruise the Adriatic on this superb one-way cruise for 7 fabulous nights on the Deluxe Ship the MS Summer or MS San Spirito (new ships for 2020 season). Breakfast, lunch and excursions included. 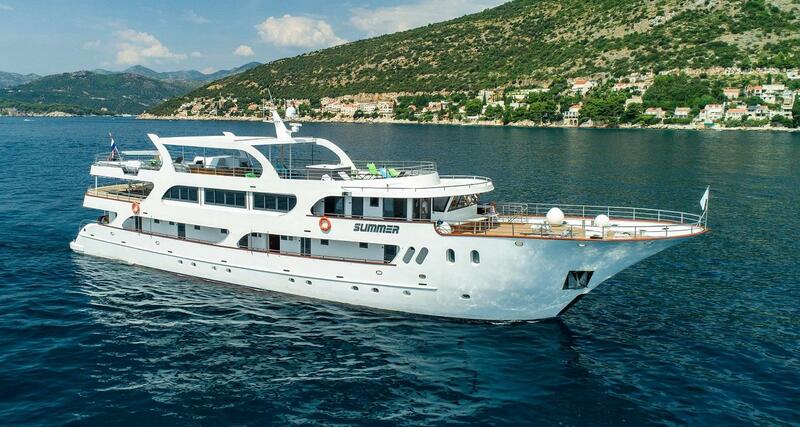 MS SUMMER & MS SAN SPIRITO will be docked in Dubrovnik Gruž harbour where you can board during the entire day. Join the welcome meeting at 7:00 p.m. where our cruise director will introduce you to the captain, crew and your future fellow passengers, with whom you will spend a week on board. Welcome dinner will be served at 7:30 p.m. The embarkation will be possible throughout the day. Passengers arriving in the morning cannot enter their cabins before 1:00 p.m. However, they can leave luggage on board. Captain will wait for all the passengers arriving late at night and these guests will be provided with a dinner. After breakfast, our English speaking guide and coach will come to the pier. Coach will take us to the historical centre of Dubrovnik, the famous city enlisted as UNESCO World Heritage Site, where our guide will show you the most interesting sights of Dubrovnik. After the city tour you’ll be left on your own to explore and enjoy this city, known around the world as The Pearl of Adriatic. At 12:00 we’ll have a transfer to the ship. Lunch will be served on board en route to Mljet National Park, where we shall arrive late in the afternoon. This morning you’ll be free to explore National Park Mljet (entrance fees are not included), to walk around the Great and Small Lake, visit The Islet of St. Mary with its Benedictine Monastery dating from the 12th century and, of course, take a swim in the heart of this pristine National Park. Lunch will be served on board as we continue our cruise toward the Island of Korčula, where we shall arrive in the afternoon, docking in the Town of Korčula. This historic town is known as the birthplace of Marko Polo, one of the most famous world explorers of all times. Our English speaking guide will do Korčula City tour and walk us through the town’s charming narrow and cobbled streets. You’ll have the rest of the evening free to enjoy dining at one of the local restaurants of your choice. In the morning, we’ll continue our cruise to the Island of Vis, with a swim stop en route. Arrival to Vis is scheduled for the afternoon. Vis is rather unique compared to other Croatian Adriatic islands. Due to its important strategic location on the open sea, it served as a military zone for a long time and was consequently spared of the usual tourist development. Beautiful beaches, ecological agriculture and preserved traditional architecture make up the advantages of this remarkable Croatian island. You will have afternoon and evening free in Vis, to enjoy its unspoilt nature and dine in one of family run restaurants. #Optional afternoon Vis Island Tour excursion. We start our tour of Vis, our coach will follow the old road, rises above the town and overlooks the bay. We stop on hill to see fertile fields, the largest freshwater surface on the island, named Lokva, and a former allied airport from WWII. After that we descend to the fields and drive through vineyards and olive groves, and then we descend us down to Komiža where we’re greeted by a local guide and taken on a tour of beautiful town boasting the longest fishing tradition on East Adriatic. After relaxed time in Komiža we will go to one local farm to have traditional dinner and taste owner's vine and local products. Return to a boat for overnight. Price per person is 50,00 EUR and it include English speaking guide, Return transfer, winetasting and dinner at the local farmhouse. Reservations and payment on the spot, minimum 10 pax. We'll start our day with a morning cruise towards Island of Biševo and its Blue Cave. Originally, the entrance to Blue Cave was located below sea level, which required visitors to dive deeply in order to resurface into the cave’s mysterious blue depths. Sunbeams penetrating through the cave’s submarine opening get reflected from the white bottom floor, colouring the cave aquamarine and objects in the water silver, creating a truly stunning and magical natural phenomenon. However, at times high waves prevent the entrance to Blue Cave, which is something we shall not know before the morning designated for our visit. For this reason, entrance fees are paid on the spot – if we 'all lucky enough to visit the cave! After a swim stop and lunch, we'll continue cruising along many idyllic coves and bays towards Hvar, the sunniest Croatian island. Hvar is one of the most popular and attractive Croatian tourist destinations and a meeting point of the international jet set. Upon our afternoon arrival at Hvar, a local English speaking guide will walk you through the town, introducing you to the island’s way of life, its rich history and culture. You'll learn how lavender was traditionally farmed on Hvar, for many centuries. Afterwards, you'll be free to enjoy your evening in Hvar, to explore on your own and dine in one of its numerous family owned restaurants or taverns. We'll start our day with a morning departure towards Bol. Bol is famous for having one of the finest European beaches, called Zlatni Rat (Golden Cape). As we stop in Bol, you can relax in this charming Dalmatian town. Have a walk, a cup of coffee or a swim, until lunch is served on board. After lunch we’ll continue cruising towards Pučišća, with refreshing swim stops en route and lunch served on board. Pučišća is the biggest village on the island of Brač. Nowhere in the system of towns and villages in Dalmatia does terrain play such a compelling role as in Pučišća. Its spectacular irregularity of steep-sided natural harbour, authentic Mediterranean architecture and rustic ambience are simply unforgettable. The fjord-like inlet of Pučišća meets three narrow valleys that descend from the hills, joining the bay’s quiet and beautiful waters. Pučišća quarry was exploited by Romans in the antiquity, after which it was abandoned until the reopening in 1455. Stone from Pučišća quarry was used to build limestone columns of the White House in Washington DC, Vienna Parliament and many other famous buildings around the world. Pučišća is also home to the only Croatian Stonemasonry school. Its students carve sculptures from Brač limestone, applying traditional and unconventional tools that have been used here for centuries. We shall spend a night in this very quiet town. Enjoy the nightfall, as it unifies the distinct features of Pučišća that have intrigued us so much in daylight. After breakfast we'll cruise across the Brač channel to Omiš, an ancient town with city walls, fortresses and stone churches. Omiš is located at the delta of Cetina River, with its wonderful beaches. For centuries, Omiš was for a stronghold of famous pirates, a symbol of retaliation, courage and strength in the long historical fight against The Republic of Venice. After a relaxed walk in Omiš we’ll have lunch. During the afternoon hours we'll sail on towards Split, our last stop. Our English speaking guide will do the afternoon Split City tour and walk us through the historical Diocletian’s Palace. The second largest urban centre in Croatia and the seat of the Split- Dalmatia County, Split boasts 1700 years of history. Since 1979 the historic centre of Split has been inscribed on the UNESCO World Heritage Site List. City’s historical and cultural buildings are located inside the walls of the Diocletian’s Palace. After the city tour you will be left on your own to explore Split and have an intimate farewell dinner on your own. #Optional Friday afternoon farewell excursion to National Park Krka. The Krka National Park was proclaimed in 1985 and is the seventh National Park in Croatia. The whole area is rich with vegetation as well as birds and fish. Due to new strong preservation laws, this extraordinary area has been kept in its original pristine state. From the boat we will depart after lunch, arriving there around 3.30 p.m. Walk through National Park, Skradinski buk waterfall, the longest waterfall on the Krka River, as one of the best known natural beauties of Croatia. Walking part will be ended at The Skradinski buk Ethno Village at Krka National Park recently received the prestigious Golden Flower of Europe award in a competition among several thousand sites. Return by scenic road from Krka to Split, arriving to Split through Golden Door, where we will have orientation Split City tour ending our journey at our ship. Price per person is 50,00 EUR and it include English speaking guide, Return transfer, entrance fees to Krka National Park, orientational Split City tour at return. Reservations and payment on the spot, minimum 10 pax. Including: English speaking guide, Return transfer, Entrance fee to Krka National Park, Split city tour, Wireless headset system for excursion. Note: Walking over cobblestone streets, uneven surfaces and slopes, recommend comfortable walking shoes. After breakfast, the time has come to say farewell to all your new friends. You must disembark your cabin by 09.00hrs, but you can leave your bags on board if you are departing later. Ship Description: All ships have WIFI.